With BTOP funds, DDJC member groups Allied Media Projects and East Michigan Environmental Action Council designed and implemented the Detroit Future Media, Detroit Future Schools and Detroit Future Youth programs. 12 DDJC organizations launched public computer centers in neighborhoods across Detroit, and the Open Technology Institute supported the deployment of community wireless networks in several of these neighborhoods and provided documentation and evaluation of all BTOP-funded programs. Following the report-back, a special edition of the DDJC’s “DiscoTech” (Discovering Technology Fair) will allow community members to learn more about digital justice through hands-on media and technology stations. This event is free and open to the public. All ages are welcome and encouraged. 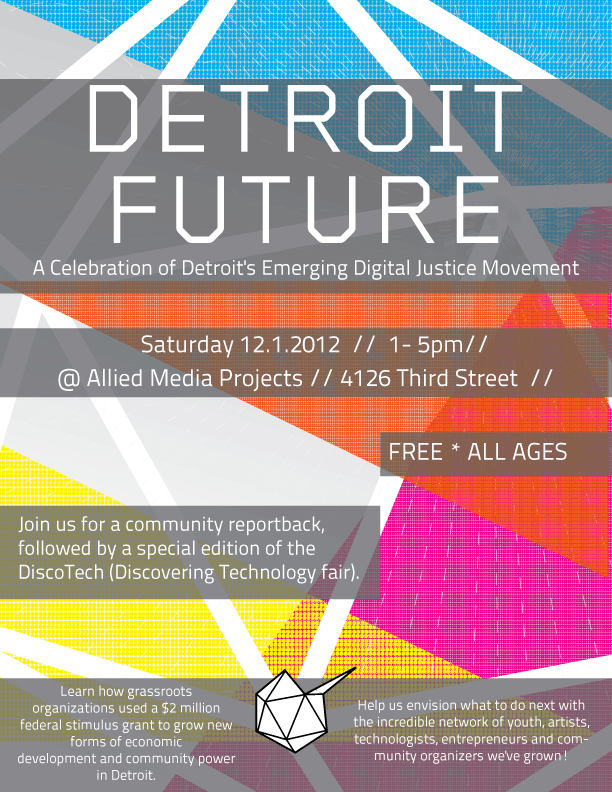 It will take place from 1pm – 5pm on Saturday Dec. 1, 2012 at the offices of Allied Media Projects, 4126 Third Street in Detroit’s Cass Corridor. Members of the Detroit Digital Justice Coalition and Detroit Future programs have spent the past two years leading trainings, weaving networks, building transformative education practices and community organizing to bring about digital justice in Detroit. They started with the shared principles of access, participation, common ownership and healthy communities and designed the Detroit Future programs to put those principles directly into practice. The Detroit Future celebration will also extend an opportunity for new people to get involved. During the “DiscoTech” portion of the event, participants will travel through different stations hosted by members of the DDJC and Detroit Future Network, where they will learn hands-on media and technology skills while contributing their ideas to shape the next phase of Detroit Future.